Never let anyone tell you that good reviews are easier to pen than bad ones; it is difficult to think of a fresh summation of Nobrow's flagship anthology, other than this: it's last 2 volumes have been as exemplary as a showcase of graphic art and illustration that you could ever ask for. The anthology has gone from strength to strength since it's original incarnation -which was larger in format and purely illustrative- settling into the A4, double-cover, flip book guise- one half comprising of comics, the other of illustrative spreads. Editors Sam Arthur and Alex Spiro's keen curative abilities are once again on display, drawing together a host of fine contributors from around the world, including Kyla Vanderklugt, Raymond Lemstra, Hellen Jo, Disa Wallander, Joseph Lambert, Bianca Bagnarelli, Mikkel Sommer, Merijn Hos, Yukai Du, and many more. It's common for anthologies to be themed; it lends them a loose cohesiveness, even as individual style and interpretation ensures a degree of variation. The theme for this 9th volume of the anthology is 'Oh So Quiet,' asking artists to explore the concept of silence: 'How is silence expressed? Can it be visual? As we hurtle along at breakneck speed accompanied by the great cacophony of modern life, we rarely experience a moment of silence. Silence, with its implication of stillness and absolute purity, becomes an impossibility.' It's a theme/remit that is perhaps more challenging to the comic creators, who are used to interposing words and pictures for effect, and now have to work with the latter alone in order to convey what they want. 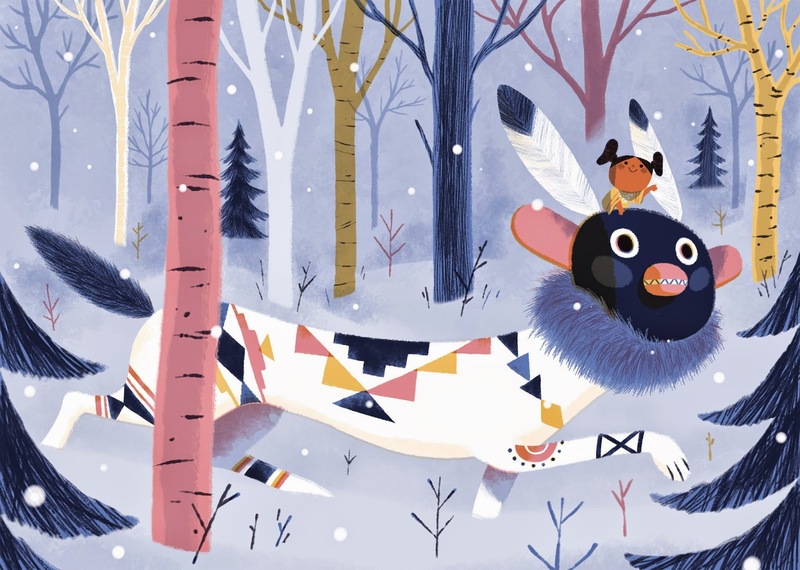 As you might expect, there's a lot of going back to nature and away from the everyday noise of life and machines: Ella Baily, David Doran, Sarah Jacoby, and Joe Todd Stanton's illustration pieces all feature a communing with nature: camping under the starts, relaxing on the branch of a tree, sledging in the snow, reading a book at the lake-side. Paige Jiyoung Moon and Elisa Macellari ruminate on that idea further, with people plugging/unplugging into technology- headphones, laptops: the silence that comes from drowning everything else out. Then you have some wonderful imaginative, fantasy spreads, escaping into the dream-like: Leo Espinosa's little girl riding on the back of a happy, curious beast is utterly charming, as is Natalie Andrewsn's blase adventurer, giving nothing away as she fishes in waters teeming with monsters- I really like the textures in Adrewson's work, simultaneously atmospheric and lovely. 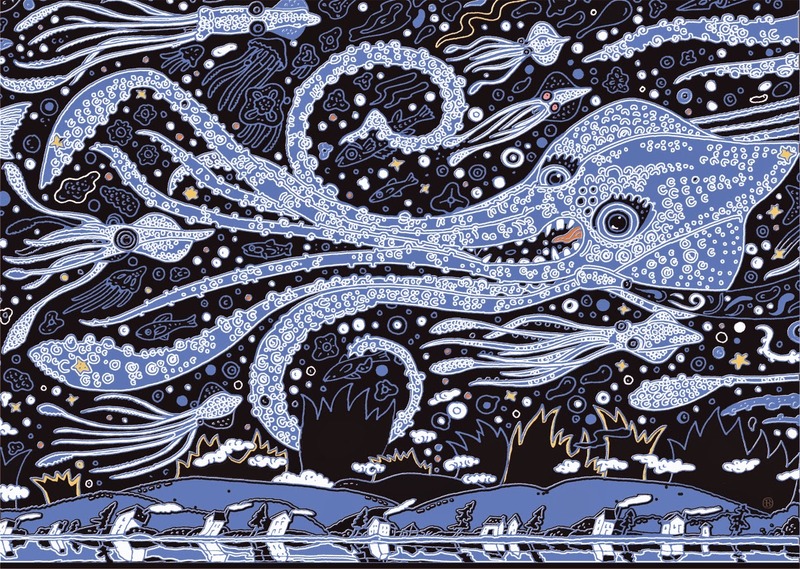 Roger Demuth takes us to the silent depths of the ocean -or is it the sky- with his beautifully luminous floating cephalopods, intricately patterned, infusing tribal tattoo designs with an inky glow in the dark aesthetic. 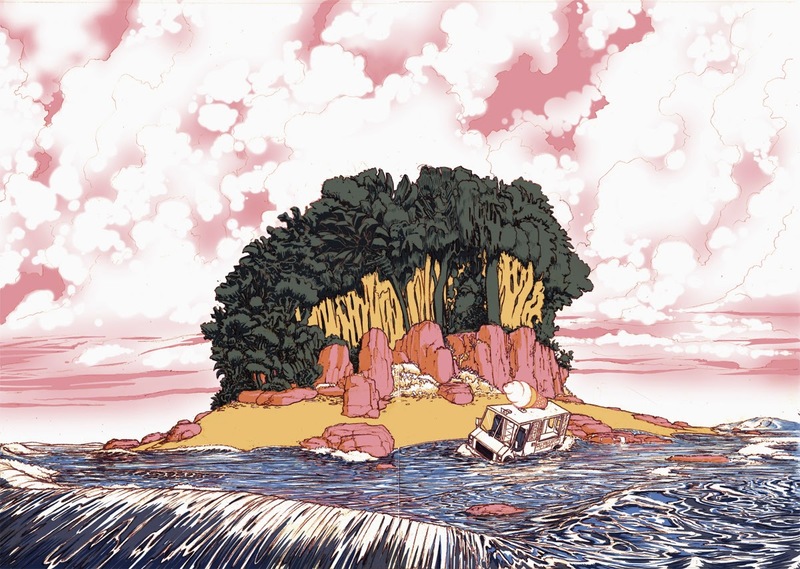 My favourite illustrative piece here has to be Stephen Carcello's island: it's just a superb bringing together lots of elements to create a stunning, visually arresting work of art. I like how the trees are all spiky and rigid, clumped together in a way that makes them look like broccoli, the cloudy pink sky is reminiscent of watercolour washed blotting, and the sea given a very deliberately rendered, Hokusai effect. And then, just to the side of that, you have the surreal sight of a washed-up, abandoned ice-cream van. It's absolutely gorgeous and Carcello manipulates it into working so well. A mention too, for Ellakookoo's fun interpretation of a robbery quietly taking place- that was a nice change of pace and tone, which made it stand out. Moving on to the comics section, there is (if I'm correct) the first published, in-print look at Jamie Coe's abilities (Nobrow will be publishing Coe's first book, Art-Schooled, this September), and he doesn't disappoint with a wordless tale of bullied teen falling in with his tormentors to avoid aggravation. The ending to the strip may divide people, but I think it's well-executed and feasible, shedding a layer of understanding on the foregone narrative. Disa Wallander never fails to make me laugh, and her tale of cold-ridden woman sneezing out a mucus iteration of herself is no exception- it's less juvenile and more nuanced than that, I assure you, but I don't want to spoil it. Jim Stoten's contribution is a dizzying, trippy marvel, forcing you to focus and re-focus: Stoten presents you with an image then panel, by panel, slowly focuses in on a point of that image, from which you are then re-directed to another, connected image which repeats the formula. Bianca Bagnerelli's comic is typically exquisite; she always manages to evoke a sense of calm, and her style is sublime- leaning a little more geometric in design here- the panel with the smoking chimney rooftops, in particular. There are some wonderful realised little panels- a bare tree, a man in shadow smoking on his balcony, even the arches of McDonalds made pleasing. Bagnerelli is one of the best drawer of clouds in the business, and the final, wide panel of snow-topped mountains and a glittery purple sky caps an outstanding contribution. Mikkel Sommer's The Silent Visitor is a hilarious riff on the visitor from outer space (think The Man Who Fell to Earth but a bit more wry and twisted)- he paces the humour of the story perfectly; there's a 7 panel sequence (the bottom half of the page below) that's simply searingly on-point: the one-two panels, the turn of the head, the pull-back to show what he's looking at, the zooming in on the eyes between him and the dog. It's all the more horribly good when you've read the first 2 pages of the comic and then you come to this sequence because you know exactly what is about to take place. It's interesting to see both Arne Bellstorf and Hellen Jo read silent as total escape and respite, the seeking of an out- albeit in different ways: Jo in her usual sharp, semi tongue-in-cheek manner, which sees her teen girl protagonist attempting to commune with Lucifer via blood sacrifices, while Bellstorf's character readies herself for the loudest, longest silence of all. the last two volumes of the anthology have been elevated by the four-way colour choices- Nobrow 8: Hysteria was a slightly neon, acididc, edgy affair, and the gorgeous yellow, pink, blue and green in this edition once again help to give it an extra lift. 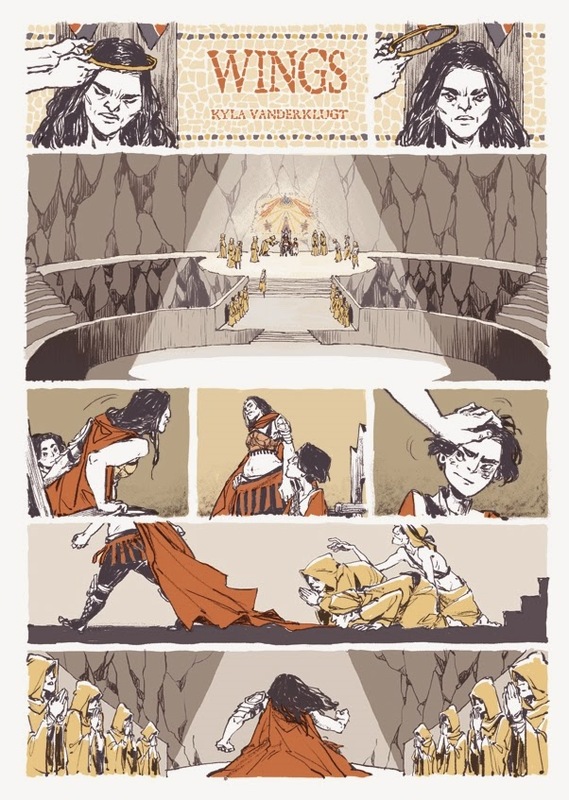 It's amazing to see artists use and stretch the colours to adapt to their needs, and Kyla Vanderklugt's comic (see below) highlights the leeway in the colour plaette, looking at those pages and bulk of the other contributions, you'd almost think it was from a different book. 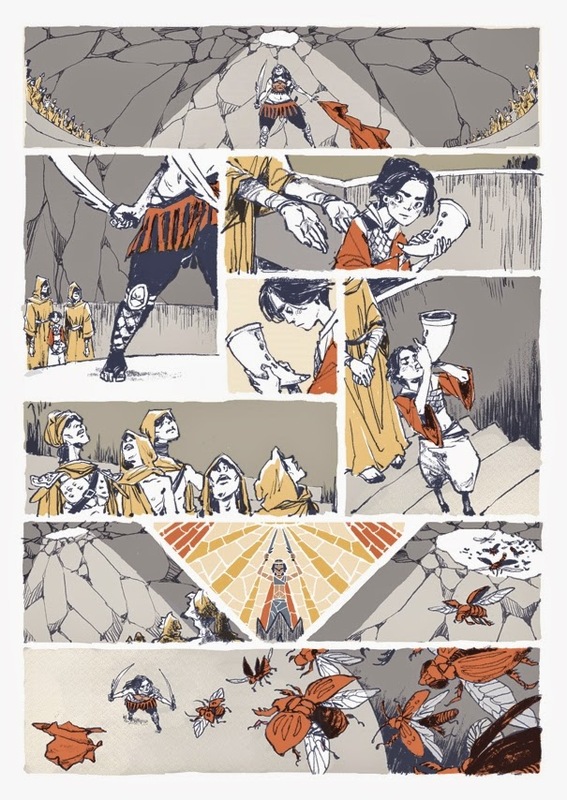 I'm aware of Vanderklugt's work via Josh Tierney's Spera, and she continues that epic adventure story, with a magnificently striking tale of rite and tradition, the hush of ceremony, silent acknowledgement, and quiet, dutiful resignation. Her art is uniquely suited to grandeur. I think Nobrow have changed things up a little in this volume by giving the comic contributors 4 pages each to play with- previously some artists were allocated 2 page strips, and some 4, and I'm not sure the new way works entirely: I feel both Joe Lambert and William Exley's comics would have benefited from the shorter page length, making those pieces more tighter and cohesive. But that's the only very minor gripe here: along with 8: Hysteria, Nobrow have not only produced one of their best anthologies to date, but also one that serves as a showcase for the eloquence and power of silent comics. I could easily sit here and go through the merits of each contribution, but I think you'd be much better served to simply buy it and immerse yourself in what is currently the foremost (Eisner award nominated!) graphic art anthology around.